As a hunter, you know deer inside and out. Knowledge is power, after all, and when you’re out there on the hunt, anything to give you the slightest advantage could make the difference between coming home empty-handed and tagging a buck fit for the record books. But do you really know all the facts there is to know about deer? While some of these interesting facts might not help your hunt, they’ll certainly inspire an even greater appreciation for the large and majestic family of animals we call deer. Cervids (animals in the Cervidae family) are found almost everywhere in the world except Australia and Antarctica. While we at Oak Creek are used to big bucks, certain deer species are actually very small. The smallest deer in the world, the Southern pudu, weighs only 20 lbs. and grows to be only about 14 inches tall. The Irish Elk (Megaloceros giganteus or Megaceros), on the other hand, was the largest known species of deer to have lived, at about 7 feet at the shoulders. It also had the largest antlers of any known deer with a maximum of 12 feet from tip to tip. It went extinct about 11,000 years ago. 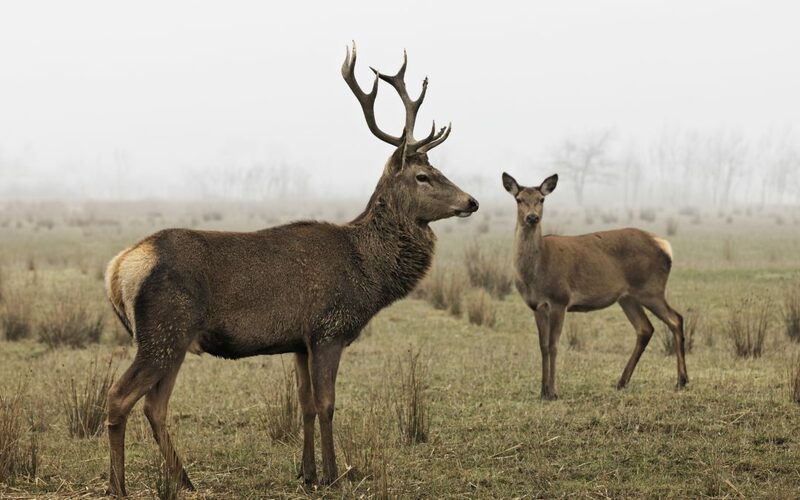 Certain species of deer, such as the European Roe deer, are monogamous. Reindeer are the only widely domesticated species of deer on the planet. Finnish Reindeer herders have also begun painting their reindeer’s antlers with reflective paint in order to reduce reindeer-car collisions. It turns out that deer aren’t as diligent in their plant-based diets as many believe. In fact, multiple researchers have caught deer on film eating birds, in some cases “eating living baby birds right out of the nests”. In fact, researchers in North Dakota found that deer were even more predatory to nests that squirrels, foxes, and weasels. Out of all mammals living in North America, deer are the most dangerous to humans due to deer-car collisions. Deer antlers are the fastest growing tissue on earth, growing as much as an inch every two days during the velvet stage. When relaxing, deer will often align themselves north/south with Earth’s magnetic field. Shooting deer from an aircraft is permitted in England—provided the vehicle is not moving or the engine is switched off. Did you know that Oak Creek Whitetail Ranch has some exceptional deer of its own? We continue to produce most of the SCI top 35 Record Book Trophy Whitetails. We hold records for 33 of the top 35 Typical and 30 of the top 35 non-typical Midwestern whitetail deer. That’s why you should make Oak Creek Whitetail Ranch your destination for your next hunt. Especially if you want to bag an exceptional trophy animal. Get in touch with us today by calling (573) 943-6644 or visiting us online to find out more.